When it comes to heavy duty trucking and commercial vehicle applications does choosing the right battery really make a difference? After all, aren’t all heavy duty truck batteries the same? The Trojan Reliant OverDrive AGM 31™ battery is a true deep-cycle battery. 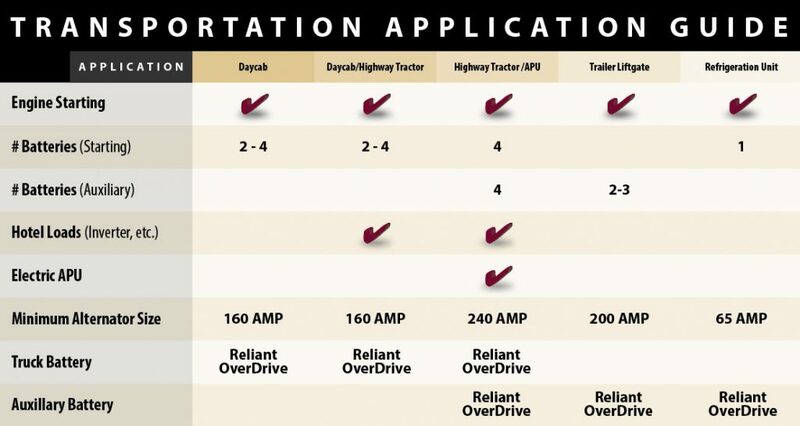 Engineered to withstand the rigors and abuse of deep discharge applications, the Reliant OverDrive AGM 31 incorporates a series of design features essential to deliver the long duration energy storage required for heavy duty APU, inverter and liftgate applications. Selecting the wrong type of battery will cause disappointing performance, shortened lifetime and wasted money. Most flooded starting and dual-purpose batteries are best suited for intermittent use and not deep-cycle applications. The Reliant OverDrive AGM 31 delivers high power cycling for extended periods of time, with the ability to provide 730 cold cranking amps. The Reliant OverDrive AGM 31 is the only deep-cycle battery exclusively engineered to meet the demanding needs of Heating and Air Conditioning (HVAC) and APU requirements without truck idling. The Reliant OverDrive AGM 31 delivers the rugged durability and deep cycling capabilities required for heavy duty and severe-duty liftgate applications. Refrigeration and inverter needs are met with Reliant OverDrive AGM 31 by providing consistent and reliable performance. Reliant OverDrive AGM 31 delivers outstanding starting power – even in extreme weather conditions. Trojan’s Reliant OverDrive AGM 31 battery features robust plate construction, heavy duty corrosion resistant grids, high-density paste and a rugged polypropylene case. The battery-based electric APU system from Idle Free, powered by Trojan, is a perfect fit with our corporate environmental initiative to reduce emissions caused by truck idling.